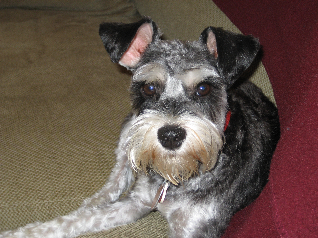 The story that Abby related to me of Charlie, the (extra-petite) miniature Schnauzer, doesn’t take long to tell, but the look in Charlie’s eyes in the photos, above, communicates the profound experience she faced with her ailing owner and her resolve to do her best to protect him and contribute to his comfort with every bit of her special energy. Abby’s husband, Mert, had been disabled by MS for many years, and then faced a heart attack in January 2009. Charlie had always been a very loving, cuddly dog to Abby and Mert and their friends, but during Mert’s convalescence, she would stay by his side constantly. Subsequent to a hospital stay, since his nursing home allowed dogs to visit, Abby brought Charlie every day for visits, and she wouldn’t leave his side. When Mert eventually was released to come home, and physical and occupational therapists came on the scene to work with him, Charlie stepped it up a bit: with Mert lying in bed, Charlie would lay across his chest, to cover as much of him as her little body could in an effort to protect him from perceived danger or harm. If these therapists would raise his arm up and around in the course of the therpy, the little dog would push their arms away with her head. This story is testament to the kind of support and loyalty that dog owners often talk about; “They just know” when they are needed and what kind of comfort will help. Charlie and Abby live near Baltimore, MD.